AUTHOR INFORMATION: In 2007, multiple award-winning James Patterson was the bestselling author of the year, with more than 16 million books sold in North America alone. In total, James' books have sold an estimated 150 million copies worldwide. He is the first author to have #1 new titles simultaneously on the New York Times adult & children's lists, and is the only author to have five new hardcover novels debut at #1 on the list in one year—a record-breaking feat he’s accomplished every year since 2005. To date, James Patterson has had nineteen consecutive #1 New York Times Bestselling Novels, and holds the New York Times record (forty) for most bestselling titles by a single author. Patterson is the creator of the bestselling Alex Cross detective series which includes the Hollywood-adapted “Along Came a Spider” and “Kiss the Girls”, starring Academy Award-winning actor Morgan Freeman; the Women’s Murder Club featuring Lindsay Boxer from which the ABC television drama series is adapted; and the SF/fantasy YA series, Maximum Ride, which is currently being adapted into a movie by Avi Arad, the producer of X-Men and Spider-Man. Patterson has also authored books behind five other films on the Hollywood fast-track, included “The Dangerous Days of Daniel X”, which was optioned by New Regency Pictures. Michael Ledwidge is an author of crime thrillers including “The Narrowback”, “Bad Connection” and “Before the Devil Knows You're Dead”. He also collaborated with James Patterson on “The Quickie”, the Michael Bennett series, and “The Dangerous Days of Daniel X”. PLOT SUMMARY: From the day that his parents were brutally murdered at the age of three, Daniel X has been forced to make his own way in a dark and unforgiving world with little knowledge about his family or where he came from, and faced with an uncertain future and a mission beyond anyone’s imagining. You see, Daniel’s mother and father were actually Alien Hunters, working their way through The List of Alien Outlaws hiding on Earth. 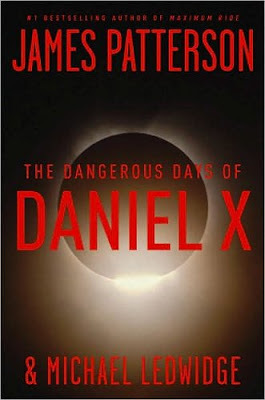 CLASSIFICATION: “The Dangerous Days of Daniel X” is described as ‘Spider-Man meets Men in Black’, but a more accurate description would be Superman—or Smallville—meets Men in Black. Like Patterson’s Maximum Ride series, the book is aimed at a younger audience, although in this case the novel is probably suited more for readers under the age of twelve, because of the ultra-safe content and language. 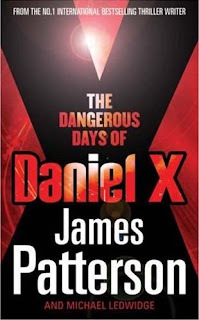 In other words, don’t expect “The Dangerous Days of Daniel X” to be on the same level as Harry Potter or His Dark Materials, but more in line with R.L. Stine’s Goosebumps or the Hardy Boys. FORMAT/INFO: Page count is 256 pages divided over the opening “True Confessions”, a four-part Prologue, ninety chapters, and a two-part Epilogue. Narration is in the first-person, past-tense exclusively via the protagonist Daniel X who occasionally breaks the fourth wall and addresses the reader. Story is self-contained, but is part of an ongoing series and includes an excerpt from the next Daniel X adventure. July 21, 2008 marks the North American Hardcover Publication via Little, Brown and Company. The UK version was released by Random House UK on July 3, 2008 and comes in two different editions (see insets). 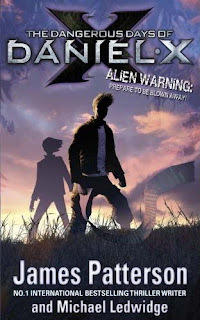 Also continuing the story of Daniel X is the “Daniel X: Alien Hunter” graphic novel—written by James Patterson and Leopoldo Gout (Ghost Radio) with art by Klaus Lyngeled and Jonathan Girin—which is due out December 1, 2008 via Little, Brown and Company. Anyway, it was definitely geared for younger than I thought too, but it sounds like it's a bit better than the original novel. Sounds like a fun summer day book. Probably pick it up. ps tell the fam i said "hi!" Hey I can't figure out what the main setting is could you help me out? The book is great as always; I've just been always wondering how much work does Patterson himself and how much does he just buy under his brand for his co-authors.